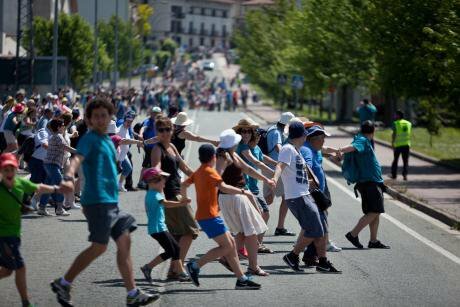 The human chain through the Basque region on 8 June 2014. Demotix/Javi Julio. All rights reserved. Anjel Oiarbide a leader of the social movement behind this gathering, known as “Gure esku dago” (It´s up to us), has declared his joy at the success of the initiative while assuring that further gatherings will follow. Today's initiative was proposed a year ago by a movement created in 2007 in the district of Goierri (Gipuzkoa) in support of the right to self-determination. They were following the steps taken by the Scottish people regarding Scotland's independence. 50,000 people were required to create a human chain in order to cover the 123 kilometres between Durango and Iruñea but in these last weeks the event has gone beyond all expectations; just a week ago up to 100,000 people showed their support in order to participate in the event. In the end, more than 150,000 people joined the initiative, according to the organizers. The volunteers grouped behind the initiative “Gure esku dago” have achieved a double objective. On the one hand they have been capable of bringing together people from different political backgrounds under the same flag. The support shown during the last weeks to the human chain by different political leaders of a variety of political parties and trade unions is but a reflection of it. And the support shown to the initiative by the political movement “Podemos” (We can), that shines like a new star in Spanish politics since the last European elections, is a fact that should be taken into account. The second test that the organisers of “Gure esku dago” have had to face with, has been that of the infrastructure and the organisation. Thousands of people have been taken in around a thousand buses to the place in which they had to cover their kilometre within the human chain and different parking spaces and other services had to be assured for the security of the event. Without a doubt, this giant mobilization that has been going on in the last months will leave its own mark in the Basque Country. Searching into history, this giant human chain of 2014 has a precedent. In 1977, during the political transition that followed after Franco’s death, “The march for freedom” flowed though Basque towns until its arrival to a field in Ororbia, near Iruñea (Pamplona). It was in this field that the march proposed by the historic separatist leader Telesforo Monzon ended after a massive political meeting. That gigantic popular movement ran in parallel with the first Spanish elections and with the political negotiation that went on among certain politicians in order to facilitate the process of transition and the Spanish constitution itself. This time it has been the turn of “Gure esku dago”, at a time in which Spain is again going through a major crisis or a transition in which it has to deal with the anger spread in society due to the consequences that the major crisis of the 21st century has generated. A time in which the Spanish monarchy, one of the essential parts of the Spanish political system is drowning in a sea of scandals. A time in which the Spanish State’s unity is cracking due to Catalonia’s wish to become separated from Spain. Anjel Oiarbide of “Gure esku dago” has already announced that other events will follow during autumn. It will be interesting to observe how this popular demand for the right of self-determination matches with the negotiations that supposedly are going on between the major political parties in this new period of political transition for Spain. Most of the citizens interviewed by the media have stated that the human chain has been a major success and that its consequences will be felt in the following days and weeks. As for the media, the success had arrived a day earlier. Several news agencies, including ARGIA, have worked as a network in order to spread the word about the event, augmenting that the message that “Gure esku dago” has been promoting over the last months. Our common needs, wishes and interests must prevail over our differences. This article was originally published in Basque on Argia.